You think of “Mexico” and imagine desert, tequila, and tacos. You don’t think about mountains, mountain streams, and an abundance of trout. So just might enjoy the surprise and the flavor of this lovely recipe, from Rustic Mexico. Here you find a combination of trout, tomatillo, and avocado. The result is beautiful to behold but not too beautiful. You’ll quickly begin to devour this impressive dish. Rinse the trout and pat dry, inside and out. season inside and out with salt and pepper. Stuff the cavities with the red onion, sliced garlic, sliced lime, and half of the cilantro sprigs, dividing all the ingredients evenly. To toast the avocado leaves, using tongs, hold a leaf 2 inches (5 cm) above the flame of a gas burner on the stove top, passing each side quickly over the flame a few times until it turns a uniform brighter green. (If using an electric range, hold the leaf 4-6 inches/10-15 cm above the heat source.) Repeat to toast the second leaf. Crumble the toasted leaves into the cavities of the fish, dividing them evenly (or add 1 tarragon sprig to each). Close the trout. Cut 12 pieces of kitchen twine and tie each trout 3-4 times around the belly, gently but securely. To make the avocado sauce, chop the tomatillos coarsely. In a blender or food processor, combine the tomatillos, avocado, white onion, garlic, chopped cilantro, and 1 teaspoon salt and process to a smooth puree, · stopping to scrape down the sides as needed. Add ¼ cup (50 ml) water and pulse to combine. Add more water for a thinner sauce. Taste and adjust the seasoning. In a large frying pan, heat the oil over medium heat. Spread the flour out on a large plate. When the oil is hot, lightly dredge each trout in the flour, shaking off any excess, and lay it in the pan. Cook until golden brown on the first side, about 7 minutes. Using tongs or 2 spatulas, carefully turn the fish and cook until the skins are golden on the second side and the flesh is opaque throughout, about 7 minutes longer. 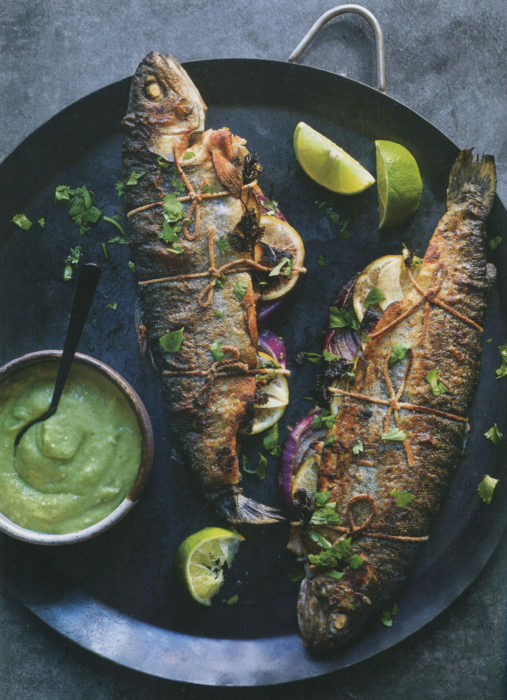 Serve the trout on individual plates and pass the avocado sauce, rice, and lime wedges. COOK’S NOTE: A variation on this recipe is to wrap the stuffed trout in soaked corn husks. Tie with strips of the corn husk and grill the fish directly over a hot fire for 7 minutes per side.